MICHIGAN STADIUM photo picture art print prints for sale - Michigan Stadium UofM photo picture ANN ARBOR, MICHIGAN UofM Michigan Stadium PHOTO picture photograph prints picture: TITLE for ordering is : " MICHIGAN STADIUM FIELD " - University of Michigan Stadium U of M football photography prints picture for sale - This U of M Michigan Stadium photo is a picture of an original black and white hand-colored photo showing a packed house at U of M's Michigan Stadium. In this University of Michigan Stadium picture photo the scoreboard shows Michigan beating Purdue 21 to 3 as 100,000 plus fans in this U of M Michigan Stadium photo in Ann Arbor, the largest football stadium in the country, cheer the Maize and Blue Michigan Wolverine football team on to another victory. This picture photograph of UofM Michigan Stadium shows the Ann Arbor skyline in the distance. This Michigan Stadium Wolverine football game picture photo is a very striking artistic picture with the football playing field and scoreboard colored in and the entire crowd and the rest of the photo left black and white. 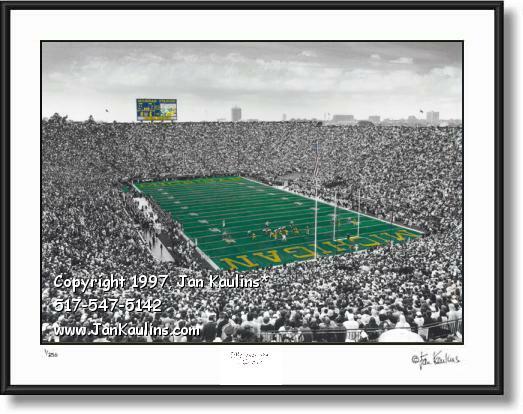 This U of M Michigan Stadium picture photo would be a great gift for a member of The University of Michigan Alumni Association member. Go Blue! TO SEE MORE HAND-COLORED UofM MICHIGAN STADIUM PHOTOS AVAILABLE ON THIS WEBSITE JUST CLICK ON THE 'Back to U of M - Ann Arbor Photo...Gallery' LINK ABOVE THIS PHOTO NEAR THE TOP OF THIS PAGE.